LAFM TV 12th Season! Episode 18! February 20, 2018	Comments Off on LAFM TV 12th Season! Episode 18! Check out today's signee spotlight on Warren Easton senior DB and Tulane signee Damien Tate Jr. There were plenty of DI signees during the National Signing Day period, but that does not mean that there are bad football players left in the state of Louisiana. Check out the link above as Louisiana Football Magazine's Lee Brecheen breaks down some of the best defensive talent in the state that could play at the JUCO level to start off and then could eventually translate their game to the DI level. There were plenty of DI signees during the National Signing Day period, but that does not mean that there are bad football players left in the state of Louisiana. 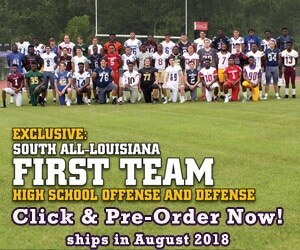 Check out the link above as Louisiana Football Magazine's Lee Brecheen breaks down some of the best offensive talent in the state that could play at the JUCO level to start off and then could eventually translate their game to the DI level. Check out today's recruit spotlight on Riverside Academy senior DB Garland Robertson! Even though National Signing Day is coming to a close, there are still plenty of more players in Louisiana that could take their talents to the DI level. Louisiana Football Magazine's Lee Brecheen gives out his biggest sleepers in the Class of 2018! LAFM TV 12th Season! Episode 17! February 6, 2018	Comments Off on LAFM TV 12th Season! Episode 17! As we head towards National Signing Day, we got you covered all week as Louisiana Football Magazine's own Lee Brecheen breaks down some of the best talent Louisiana has to offer! Check out today's recruit spotlight on Chalmette senior QB Jason Roper! LAFM TV 12th Season! Episode 16! January 30, 2018	Comments Off on LAFM TV 12th Season! Episode 16!